← Bring it on ladies! Bunko Night This Tuesday, Feb. 22. 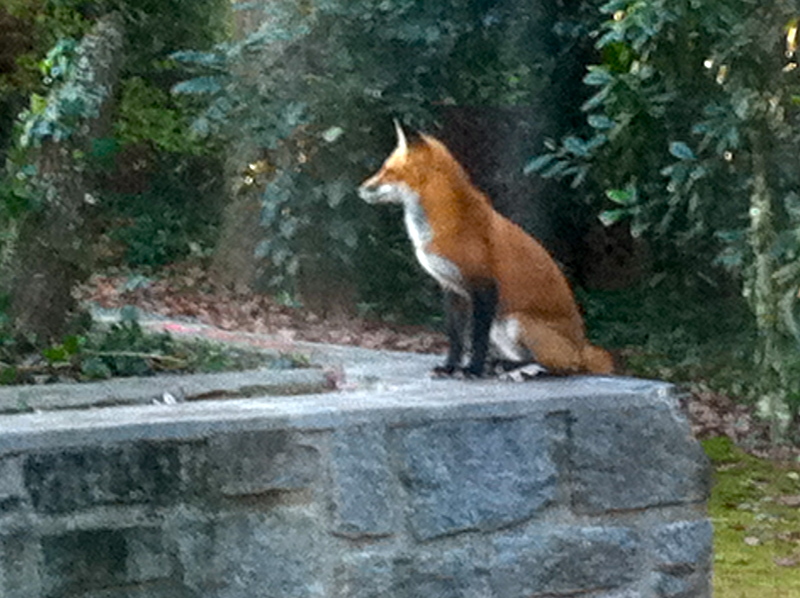 In response to neighbor Helen Ordway’s email that was sent out to the Parkwood mailing list Friday night, neighbor Lynn Goldowski submitted this photo she took of a recent visitor to her backyard — a red fox! So, as Lynn asks, has anyone else seen foxes in Parkwood? Coyotes? If you have, please comment below, especially with recent sightings made this winter or this same time last year. You’ll also want to contact Helen Ordway and her son, 5th grader David Ordway. David’s participating in Fernbank Elementary’s International Baccalaureate program, and his project is titled, “Coyotes in Atlanta.” He needs interviews and neighbors’ sightings, perspectives, and opinions concerning the presence of coyotes in our neighborhood and surrounding area. He has specific questions that would only take 10-15 minutes at the most, and he hopes to conduct these interviews this week. Helen Ordway’s number can be found in the printed Parkwood Member Directory, or you can contact me for her number. In any case, please submit photos of any Parkwood wildlife you’ve taken over the years, and tell us the story. To see photos already submitted, go to Photo Galleries, scroll down, and click on Parkwood Wildlife. You’d be amazed to discover what’s living in your backyard! This entry was posted in surveys, wildlife. Bookmark the permalink. That’s really a beautiful creature. I particularly love the black legs and black ears as contrast to the stark demarcation of the red against the white. Wonder where he lives? Thank you for sharing. And please do post if you’ve had experiences in our neighborhood with coyotes/foxes etc. I think we are all interested. Thanks! OMG! This picture is amazing, Lynn! I am so heartened to know that some of the bigger animals are making a bit of a come back in our urban neighborhood. The Fernbank Forester has mentioned that fox have long been in the Forest across the street and that they would sometimes walk the tracks along West Parkwood. The tracks have always been somewhat of a wildlife corridor – but so cool to know they are on E. Parkwood, too. Thanks for sharing. Just tell me how to get George Clooney to visit my backyard. That would be a Fantastic Mr. Fox (I’d take Meryl Streep, too)!